Instrument cable block diagram is a drawing document that presenting the simple interconnection between every devices such as field instruments to junction box and junction box to marshalling cabinet or panel and even between panel to panel. The document form is drawing that showing the field instrument tag number, cable number, junction box number and all devices must have tagging name or number. 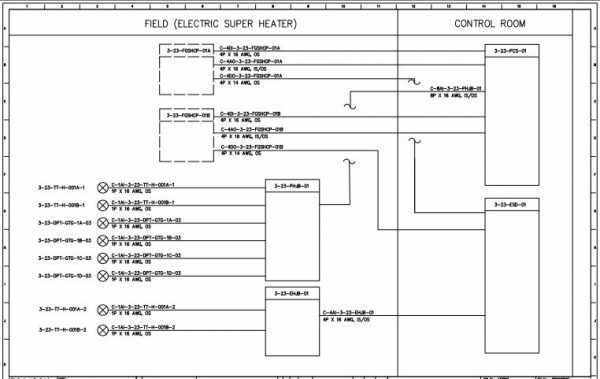 The purpose of the instrument cable block diagram document is to prepare initial design before the instrument engineer continues to the next steps like preparing cable schedule, detil wiring diagram and loop diagram. Because this is the starting point to the next complicated detailed instrument cable document, this document can be made just by thought but ideally you need instrument architecture document as refference. If you are looking for block diagram of instrumentation system and its explanation the this is that document. It may be have different name on different projects but the ideal name of this document that is representing basic diagram to show the interconnection between field devices to splicing means untill controller panel is instrument cable block diagram. Another document that can be used as refference or to check the correctness of this document is instrument index or I/O list. From that it can be checked whether every instrument devices that need cable already interconnected on the drawing.